Switching off to re-connect again is something that is an I have noticed that sometimes mEtiquette is affecting the way we spend time with each other. 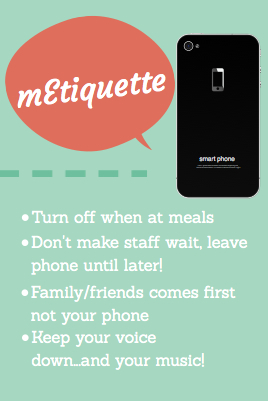 mEtiquette (or etiquette when using your mobile devices) is starting to creep into dinner time, catchups with friends and families and even play dates. Only recently, I had the experience of being ‘told off’ for having my iPad at the dinner table and felt very sheepish after that. At the moment with my new smartphone, I haven’t logged into Facebook (and that has been a deliberate In some ways). I only use my smartphone for texting, taking phone calls and using it for my business (during business hours). I know unconsciously at the breakfast table, the iPad in our household had replaced the newspaper. We stopped getting the Age newspaper mid year last year (after getting it every day) and turned to the iPad to find out what was going on in the world. When you don’t watch the news anymore (due to dinner time/bathtime routines) our family has relied on looking at news sites to see what is the latest in news (technology gadgets for me) and social media updates. With a lot of habits, sometimes it is an unconscious habit that you actually have to acknowledge and then break. So, the new rule in our house is ‘no iPads’ at the dinner table at ANY meals. I am personally trying to break using mobile devices after 7.30 unless I am researching, working on my latest book or working on a deadline for a client. The temptation is to ‘iPad Surf’ during television shows (I used to call it ‘multi-tasking’). When do you use mobile devices with family? Do you have any limitations? 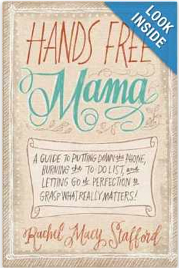 ‘Hands Free’ Mama has a great blog and she talks about ‘switching off’ to re-connect with family. She has also written a book which I have ordered from Amazon (to try and not read it on a mobile device). On a lighter note, Durex has set up a time on March 29th to turn devices so you can focus on your partner, rather than your ‘device’. I have listened to many of my friends literally have their smartphones glued to their body almost 24/7. They charge their smartphone next to the bedside table and they check Facebook updates, text messages and play games. The Make A Wish Foundation is also having a day called ‘Switch Off Sunday’, this Sunday 30th March, to raise money for the foundation. 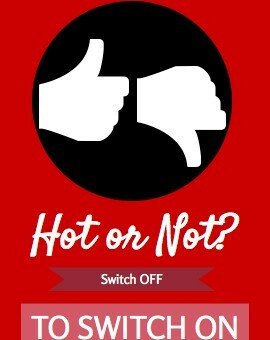 Since the beginning of the month, Switch Off participants have turned off their mobile phones for a combined total of over 25,000 hours, with many finding the challenge tough. “We’ve had some wonderful feedback from supporters who have loved the personal challenge to switch off their mobile phones for as long as they can during March, despite the challenging withdrawal symptoms! ” said Make-A-Wish Australia, CEO, Gerard Mense. What are you going to change about your ‘mEtiquette’ behaviour? Are you conscious of your habits? Comment and share this blog post with your friends and have that discussion about mobile etiquette. It is impossible to be highly productive if we keep the habit of checking our mdevices every 10 minutes. A connection has been created and neurological paths are already formed in our brains, the latter has been hijacked to perform the routine. The good news is, a habit takes 10 days to be established and it can be undone, but is much harder. It is not impossible. We refuse to be hostages.